CALGARY - Eight Team Alberta alumnae have received an invite to attend Canada’s National Women’s Development Team and Under-18 Team selection camps. Codie Cross (Airdrie), Emma Keenan (Calgary), Shae Labbe (Calgary), Malia Schneider (Millarville) and Abagael Thiessen (Red Deer) are among the 41 players invited to the National Women’s Development Team camp. Stephanie Markowski (Edmonton), Danielle Serdachny (Edmonton) and Rachel Weiss (Calgary) are among the 43 Under-18 invitees. Former Team Alberta Coach Howie Draper (Edmonton) was named the Head Coach of the Under-18 team as well. Both camps run August 4-12 at the Markin MacPhail Centre at WinSport’s Canada Olympic Park in Calgary. RED DEER – Hockey officials in Alberta will find a few changes in the registration and clinic process as they prepare for the 2018-19 season. As part of a larger restructuring at the provincial and regional levels, Hockey Alberta is implementing a fully online registration and payment process for clinics that also requires ALL adult officials (19 years and older) to have a current Criminal Record Check (CRC) on file as a prerequisite to being allowed to register for a clinic. Adult officials must complete a CRC every three seasons, as per Hockey Alberta’s policy. The CRC requirement has been in place for three seasons; therefore, officials who completed a CRC in that initial season will need to complete the CRC process again this year. CRCs are accepted only through the online platform of Sterling Talent Solutions. Once received by Hockey Alberta, it may take up to a week for HCR to be updated; therefore, officials are advised to complete the CRC process as soon as possible. Clinic listings and registration links go live on the Hockey Alberta website on August. The deadline to register for a clinic is 10 days prior to the clinic date, to allow for materials to be shipped to instructors. Registration and payment for a clinic must be done online, with payment only accepted via Mastercard or Visa (no debit or prepaid credit cards allowed). For new officials, the requirement to complete Hockey University (HU – ONLINE OFFICIATING 1/2) prior to attending a clinic remains in place. This will require a new official to set up an eHockey account if the individual does not already have one. Included in the changes is the addition of Curtis Nichols as the new Manager of Officials, based in the Hockey Alberta office in Red Deer. For any questions pertaining to the new registration and clinic process, or regarding Criminal Record Checks, please contact Curtis Nichols, Manager, Officiating (Registration/Clinics), or Mike Klass, Director, Business Operations (Criminal Record Checks). RED DEER - Twenty-eight female hockey players from across Alberta are moving forward on the Road to Red Deer. Team Alberta has announced its shortlist roster for the squad that will participate in the 2019 Canada Winter Games in Red Deer. The shortlist includes three goaltenders, nine defence, and 16 forwards. Players were selected to the shortlist based on their overall play at the Team Alberta U18 spring camp in May, and at the Provincial Camp in Camrose, July 10-15. Forty-six players were invited to Camrose from the spring camp, and worked through high-intensity on-ice sessions, as well as off-ice training and classroom sessions. Team staff includes: Carla MacLeod (head coach), Cassea Schols and Craig Perrett (assistant coaches), Amanda Tapp (goalie coach), Ally Bendfeld (video coach), Doug MacLeod (head scout), Farah Mukadam (athletic therapist), Amanda Bergen Henengouwen (equipment manager), and Heather Osgood (strength and conditioning). The shortlisted players will attend a fall camp in Edmonton in September, prior to final decisions on the 20 players selected to the Team Alberta roster. 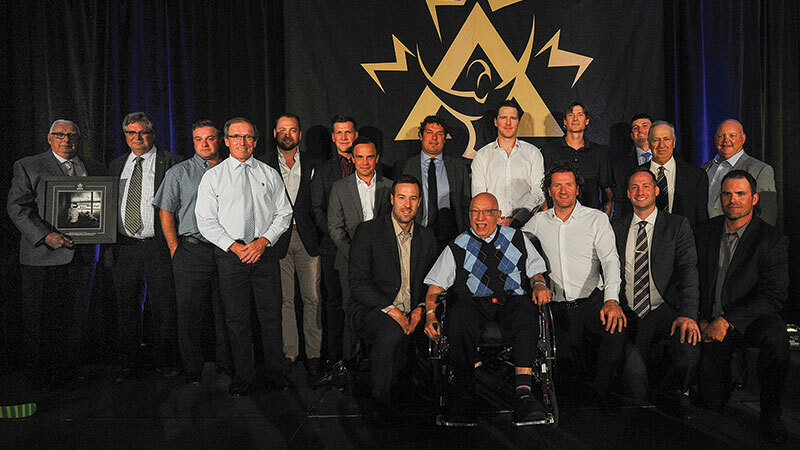 CANMORE - Four outstanding individuals, and and two Canada Winter Games gold medal-winning teams comprise the 2018 Induction Class for the Alberta Hockey Hall of Fame (AHHF). 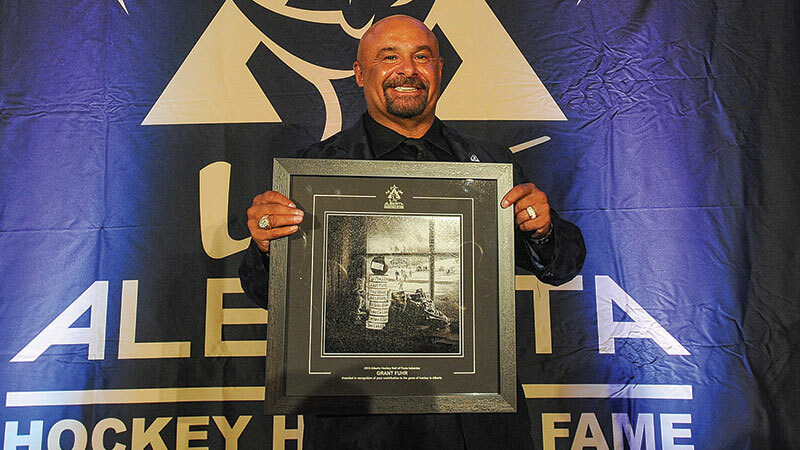 Grant Fuhr, Wally Kozak, Ron MacLean, Mike Vernon, and 1991 Team Alberta U18 Female and 1999 Team Alberta U16 Male were enshrined in Alberta’s hockey history on Sunday night at the AHHF Awards Gala, held at the Coast Hotel in Canmore. Grant Fuhr was one of the National Hockey League’s greatest goaltenders, playing on five Stanley Cup champion teams over a 20-year career (1981-2000) and earning induction into the Hockey Hall of Fame in 2003 in his first year of eligibility. The Spruce Grove native is best known for his 10 seasons with the Edmonton Oilers (1981-91). In his speech, Fuhr said thank you to some of the people who made his Hall of Fame career possible, including: Spruce Grove Minor Hockey and the parents and volunteers who made playing hockey possible; the Oilers and Glen Sather, who took a chance on a kid who was a little rough around the edges; and the Calgary Flames for allowing him to finish his career in Alberta. Wally Kozak is known as one of the best technical hockey coaches in the world. 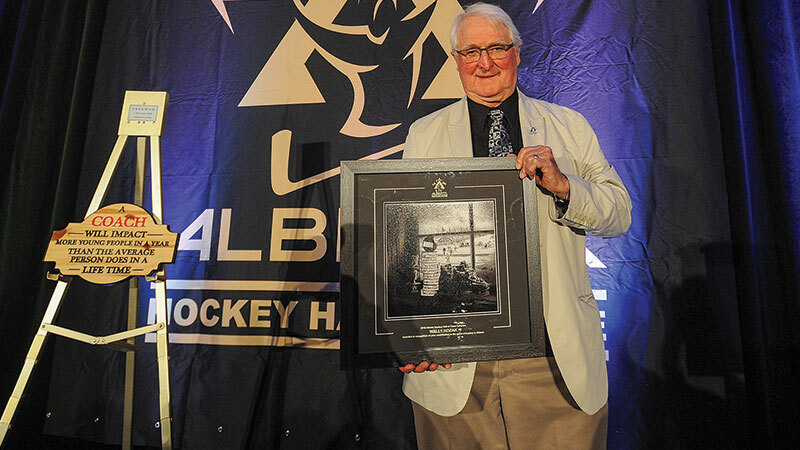 A career coach and past Head Scout and manager of Player Development for Team Canada Women’s Team, he has been an instrumental part of developing female hockey in Canada thanks to more than four decades of involvement at all levels of the sport. Kozak acknowledged four significant individuals from Alberta who pioneered coaching development programs in Canada - Dale Henwood, Clare Drake, Dr. George Kingston and Dave King. He also talked about his one year with Father David Bauer’s national team, and the influence Father Bauer had on the type of coach that Kozak would become. 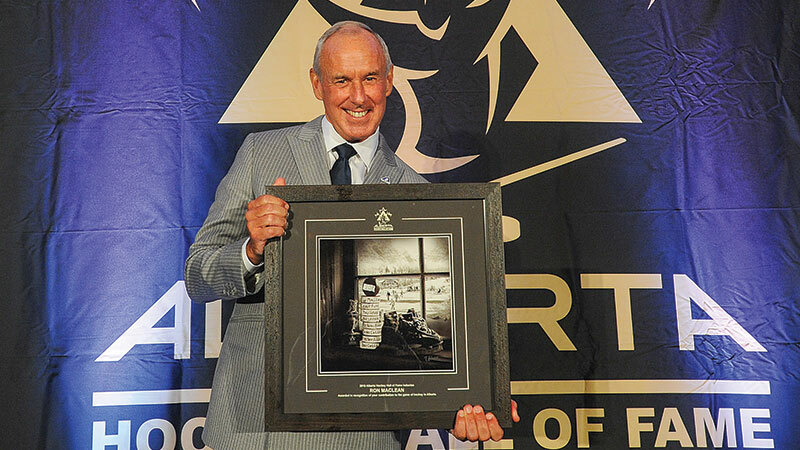 Ron MacLean has interviewed the greatest players, coaches and personalities, and his extensive knowledge and passion for the game of hockey, combined with three decades of hosting Hockey Night in Canada, has made him one of the country’s most famous and beloved broadcasters. For MacLean, this was a weekend full of memories, as he also attended his 40th anniversary high school reunion. He had memories about each of the other members of the 2018 induction class, including recalling the best save he saw from Grant Fuhr, during an exhibition tour in Norway, and Mike Vernon’s performance in an exhibition game in the 1985-86 season against Moscow Dynamo. Mike Vernon is a two-time Stanley Cup champion and a Memorial Cup winner, who played 19 seasons in the National Hockey League with four teams. Mike hoisted the Stanley Cup in 1989 with the Calgary Flames, and then again in 1997 with the Detroit Red Wings. In his speech, Vernon recalled how he used to attend camps coached by Wally Kozak, and how he and Fuhr squared off not just in the NHL, but also in the junior ranks. He extended thanks to his minor hockey coaches and teammates throughout the years; talked about how coach Bob Johnson made the game fun; and acknowledged the key roles played in his career by goaltending greats such as Glenn Hall, Dan Bouchard, Rejean Lemelin and Rick Wamsley. The 1991 Canada Winter Games in Charlottetown, PEI marked the first year for female hockey in the Canada Winter Games, and it was a record-setting performance for the players who were selected for the inaugural Team Alberta Female Hockey squad. First and foremost, the team won the gold medal, defeating British Columbia, 2-1, in the championship final. Loretta Normandeau, one of the team’s assistant coaches, recalled the challenge was finding players to invite to the tryout camp. 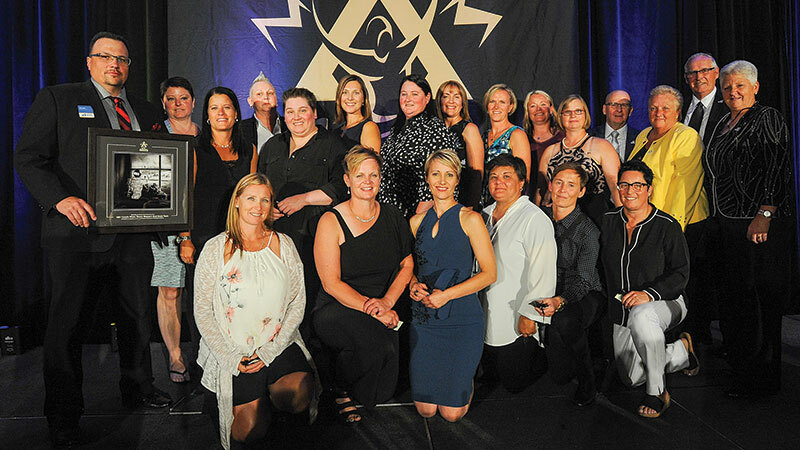 But the players who comprised the team were truly trailblazers who have helped female hockey expand from the 120 players who attended that first provincial development camp in Lacombe to the more than 8,000 registered in 2017-18 in Alberta. The 1999 Canada Winter Games marked a significant year for Newfoundland and Labrador. Not only was the province celebrating its 50th anniversary of Confederation with Canada, but it was also the first time the province had ever hosted a Canada Winter Games. For the members of the Team Alberta Male Hockey squad, they helped the host province celebrate by going undefeated to win Alberta’s third gold medal in male hockey in Canada Games competition. Ben Kilgour recalled how the team was a unique mix of players from different levels of hockey who had played against each other their whole careers but came together as a team for the Games. Then, a fortunate puck bounce in overtime, “and (Scott) Hartnell sends us here today. It happens that quick.” Kilgour thanked all the parents for the time and travel; the minor hockey programs, coaches, managers and volunteers; junior programs that allowed their players to attend the Games; and Hockey Alberta for setting the professional hockey atmosphere and giving them the chance to know the thrill of victory. The evening concluded with a hot stove discussion hosted by Maclean. Fellow iInductees Fuhr, Vernon, Kozak, Hartnell and Val Gill from the 1991 Team Alberta Female squad reflected on some of the key moments of their careers and about hockey in general. Sunday’s AHHF Gala kicked off in the afternoon with a VIP reception for the 2018 inductees, and included dinner and the awards presentation. The 20187 Alberta Hockey Hall of Fame Awards Gala is presented by Hockey Alberta, the Hockey Alberta Foundation, and ATB Investor Services. 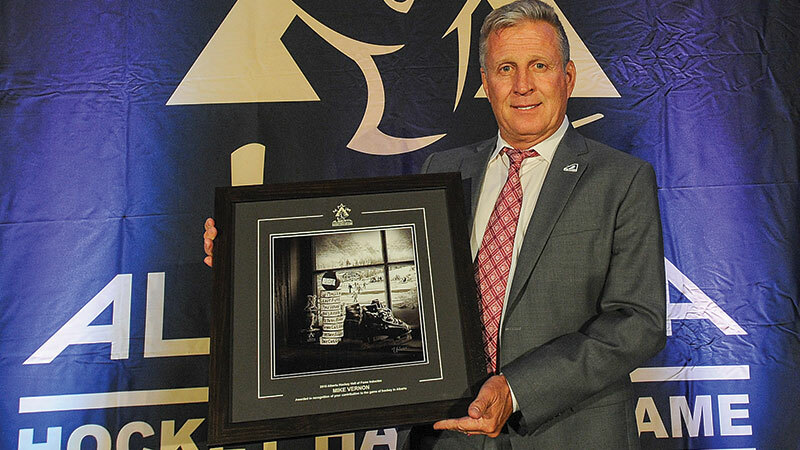 The 2018 Alberta Hockey Hall of Fame Awards Gala runs in conjunction with the Hockey Alberta Foundation Golf Classic, a key fundraiser for the Hockey Alberta Foundation’s Every Kid Every Community Program. The 13th annual Golf Classic also takes place in Canmore, beginning Monday evening with a special reception for all participants, as well the celebrity golfers. The tournament goes Tuesday at the Stewart Creek Golf Club. Celebrity golfers include Grant Fuhr, Jordan Eberle, Mark Giordano, Mel Davidson, Rob Brown, Curtis Glencross, 2018 World Junior gold medalists Dillon Dube and Cale Makar, and many more. For the 12th consecutive year, ATB Investor Services is the presenting sponsor of the Golf Classic. In addition to the Golf Classic, Stewart Creek will also host the first half of the Hockey Alberta Foundation’s annual Rinks to Links program on Tuesday morning, where 30 first-time hockey players will take part in a golf lesson. From there, the participants will head to the Banff Arena to be outfitted head-to-toe with new equipment, and take to the ice for the very first time. RED DEER - Hockey Alberta is bringing a Female Skills Development Camp to Calgary and Red Deer this August. These camps will focus specifically on female hockey players and providing the skills/development needed for unlocking athlete potential. The camps feature multiple on-ice skill development as well as multiple off-ice multi-sport sessions. RED DEER - Thirty-five athletes from Alberta have taken the next step on the Road to Red Deer. Hockey Alberta has announced its shortlist roster for the Team Alberta U16 Male squad that will participate in the 2019 Canada Winter Games in Red Deer. The shortlist includes five goaltenders, 10 defencemen, and 20 forwards. The shortlisted players will be scouted with their club teams in the fall, prior to final decisions on the 20 players selected to the Team Alberta roster. The 2019 Canada Winter Games run February 15 - March 3 in Red Deer. Registration is now open for the Hockey Alberta Super Skills Development Camps taking place in Calgary, Grande Prairie and Red Deer this August. The Hockey Alberta Super Skills Development Camp focuses on individual skill development on and off the ice. On-ice sessions include drills in conjunction with Power Edge Pro, power skating, shooting specific techniques, position specific skills and small area games. Off-ice sessions work on agility, balance and coordination and incorporate other sports, to foster overall athleticism within the Long Term Player Development model. These off-ice sessions may include activities such as golf, soccer, basketball, lacrosse, ultimate frisbee, and more.